If you want to live a fulfilling and passionate life, you have to face your fears and take action. You have to eliminate your excuses and keep going. You can succumb to whatever you think is stopping you, but in the end you are responsible for the life you live. I know there’s a lot of stuff that comes up when you begin moving in a new direction, but it’s all part of the game. Most people aren’t cut out to create a passion business. You are different though, because the mere fact that you’re reading this means that there’s something inside of you craving change. I know you have fears that are holding you back. We all have them, but if you really want to do this, you have to keep going. This is not easy, but it is what you want, right? The stars are never going to align, so you might as well get started. You are good enough to do this, even if you’re confused right now. So many people have come to me saying that they don’t know how to choose, because they have so many passions. If you have many passions, just pick one, because it doesn’t really matter. What matters is getting started, taking action and learning from real-life feedback. I know you want it to be perfect, but this isn’t a decision that will define your life. This is just the first step on your journey. When I started on this path, I burned all my backup plans. I knew that this was what I wanted. It felt right in my heart. I was determined to succeed, which is why excuses and obstacles were dismissed as soon as they entered my mind. I was still afraid, but I had no other options. If I didn’t go through with this, my life would be as it was before, and that wasn’t good enough for me. Learning how to make your fears insignificant is part of the art of living a passionate life. It is up to you to learn how your mind works, but it doesn’t happen if you stand still. Are you serious about living a passionate life? I’ve created a course where I share everything I’ve found to work when it comes to living your passion. I’ve been doing what I love since 2004. I’ve taught others how to do it since 2009. What I’ve discovered is that you don’t have to wait. You can start living your passion today. Yes, today. Are you interested in learning more? 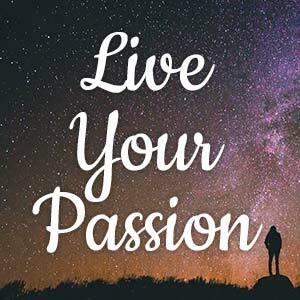 Check out the Live Your Passion Course here. Looking forward to reading your book and promoting it. You have been a busy bee these last few months and I know your hard work will make a real difference. Good stuff Henri. Your writing is very inspiring. The biggest thing is you got to take action. Good luck with the book. Yes! Action all the way! I am definitely learning that it is all about moving past comfort zones and taking action. So excited to read your ebook Henri. I know it will help a lot of people (including me). Sending you good wishes as you write! Become comfortable with being uncomfortable and you win! That one struck a chord somehow. Not because of the overly clear message that countless blogs have written about (including myself). Yes on the one hand I crave change, yet on the other hand I’m not doing what needs to be done to make the change. Like so many out there I’m just sitting here, reading blogposts about change written by people who actually took the leap and changed…. Personal development is a scary business, it means the status quo can not be maintained and even though I’m not happy with things how they are right now, it’s safer to stay here than to burn the bridges (as described in your “loosing friends” post) and head off into an insecure future where great things just might happen. Taking the first step towards freedom has long ago been set. I manage to make a few dollars through the internet, small change so far. But the ball isn’t really rolling. Things needs to change, and it won’t change with reading blogposts. There comes a point where you become so sick of your inaction that you start taking action. Get to that point and get going! I thought you made such a great point about working to make your fears insignificant. If we can consistently learn how to counter our fears with reality, we can really start chipping away at limiting beliefs and fears that may be holding us back. Looking forward to your ebook. Couldn’t agree with you more, Sibyl! Get curious about your fears and learn from them, instead of running away. You can do it! Way to go! Wish you all the best in your journey ahead. You are going to overcome all the odds and come out victorious, that’s for sure. And we are here to cheer you on. Hip, hip hooray! Hip, hip hooray! Cheerio, dude! Thanks, Archan! I really appreciate it! I’m excited to hear about this. I’d love to bring you back on BlogcastFM to talk about the ebook and how you have grown so much since the last we talked. Let me know if you’d be interested. Hit me up on skype and I can tell you about some things we’ve doing to promote the work of our interviewees. how are ya, buddy? it’s always good reading your posts, you reaffirm me that the road to success isn’t easy, but it will come in due time. your ebook sounds very interesting, I would love to help promote it! Things are rocking here. I’ve just sent you an e-mail with more info! Brett, back from the past with glory and all that. Oh, and check your email 🙂 I sent you one a while back but you didn’t respond. Hopefully it didn’t get buried in the junk mail folder, hehe. Awesome! Can you re-send the e-mail? It must’ve gotten lost somewhere along the way. I agree 100% with you about burning the bridges behind you. So many people leave themselves a back door… but if you don’t have a back door, you’re forced with only one way to go and that’s forward. it’s my first time on your site – nize work. I come back soon and see what interesting you will have to offer !